Intriguing setting & good plot. Looking forward to reading more from Michelle Wan. Adding to the "20 Books I Loved BookBox II", specially for loveamystery. Took out of the bookbox. Looks good! Lots of suspense. Didn't want to put it down. Too much "orchid" trivia for my taste, but a great mystery for orchid lovers. Released to my Recent Mysteries Virtual Bookbox for the Keep Them Moving release challenge for 2007. Aug9/07: Mailed to mssaver who chose it out of the box. Enjoy! Thanks, eicuthbertson! I look forward to reading this one! And thanks to loveamystery for starting this wonderful bookbox. This was so suspenseful that I missed my usual Sunday afternoon nap so I could finish reading the book! On its way to JDT, for no other reason that she once sent me a delightful orchid-related mystery. I think she'll like this one, too. 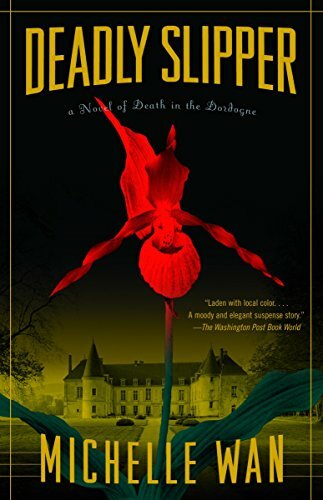 Who could resist a mystery set in the Dordogne - an area I'd love to visit someday! And it gave me a big smile to think you remembered another book focused on orchids that we shared quite a while ago! I found it in San Francesco a Ripa. Grazie, nonostante che libro e un po sciocco. Adesso siamo in Polonia. I'm so happy to know this book has enjoyed such wonderful travels! I read it during a wonderful trip to Croatia, passed it on to a good friend to read on her trip to Rome, and now the book has found a new home with a reader in Poland! Thank you, thank you, tolfa, for finding the book and making a journal entry.